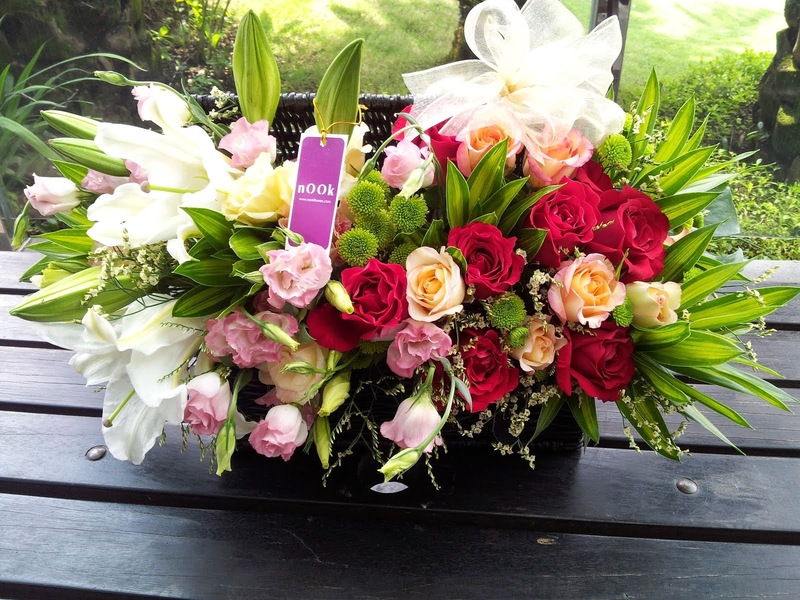 Spread the Nook Flowers’ love by 'liking' us on Facebook. Every week, 1 lucky nooklet from our Facebook followers will receive a RM50 voucher from us! Look out for it in your inbox! an afternoon with the Myanmar Refugee women of Mang Tha project – the last few weeks they have been learning flower arranging skills from Brenda, our principal florista. By Class2 we were making significant progress. A group of the ladies with their creation. Smiles all around at this class. If you'd like to support this organisation, check out their online store at www.elevyn.com/shop/mangtha. Nook Flowers, a fresh floral retail & event design firm based in Bangsar South, KL is looking to hire one full-time Assistant Florista. Duties include greeting customers, providing info about flowers for special occasions; type, quality & quantity of flowers for purchase; prepare work orders, arrange for deliveries & process payments. Assistants will also take direction for tasks such as conditioning flowers, keeping work areas clean, re-stocking display units, preparing containers & ensuring supplies are adequate. Florist assistants who have good customer service skills, can work quickly & efficiently & have artistic flair can do very well in this job. To those travelling to be with family and loved ones, be well and be safe. Nook Flowers is closed today but open as usual tomorrow. Do you thrive artistically in order or chaos? This quote came out of a posting called ‘How to steal like an artist (and 9 things nobody else told me)’ at www.austinkleon.com/blog. The backdrop that the quote’s placed on comes from a wedding we worked on last year (more photos from that wedding are in a previous post). Anyone who’s got a modicum of artistic vibe and have travelled the oft-times confusing and contradictory path of trying to find their own brand of creativity will find value in this quote. Nook Flowers is almost 3 years old and the journey of creating the Nook brand with its distinctive look, feel and identity has been a challenge and a lovely work-in-progress. I for one have a clear preference for order and abhor the muddled waves of interrupted thought that comes from chaos. Although lately I have discovered a knack for calming down chaos quite quickly, so that order can return and work progresses as planned. When all else fails, I carve out 'time-out for thinking' sessions. Figured out what works for you yet?